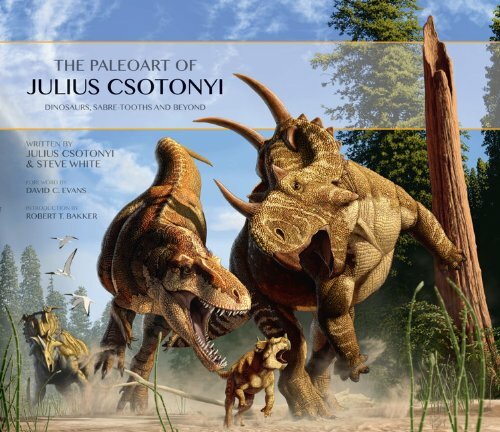 Following on from the recent interview with Julius Csotonyi and Steve White about the new palaeoart book, I wanted to take a closer look at one image in particular. This is both because it is covered fairly extensively in the book by Julius who writes about its genesis and production and because it is, in part, a result of discussions between him and myself. Julius was kind enough to ask for my advice and suggestions and I was naturally happy to give him some feedback and thoughts for artworks that appear in the book. Here though we are going to chat about one in particular as it’s so unusual: a fish-eye view of a group of sauropods making their way through the Morrison. 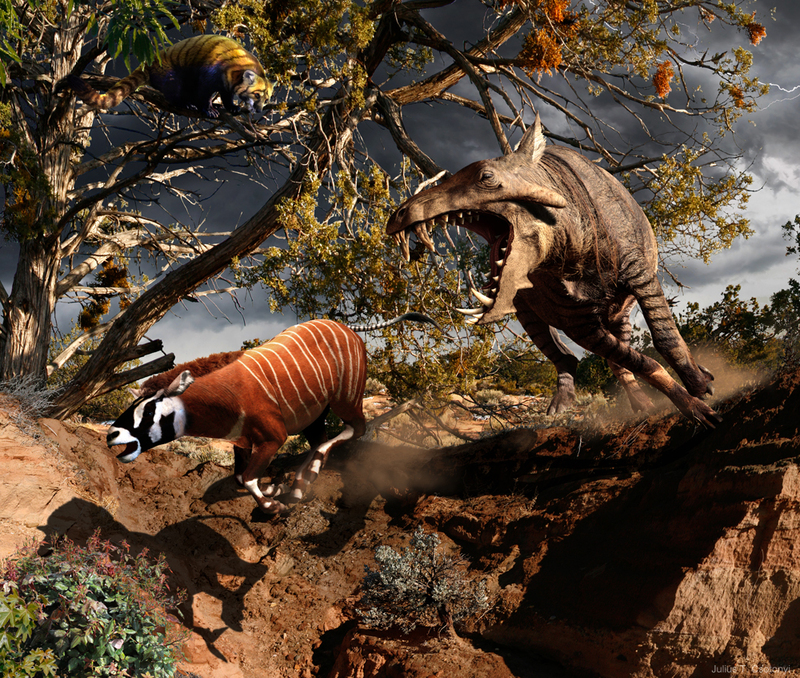 One adult is using its bulk to push down and ultimately snap a tree, while Stegosaurus and Ceratosaurus appear in the background and some small pterosaurs take flight. While obviously presented one way up in the book, the image can be rotated in either direction and to any degree and should still work fine. I’m not aware of any other image quite like it, and its certainly dramatic. Ultimately this started in Canada. Although we’d been in contact before, when I was visiting the Tyrrell as part of the “Project Daspletosaurus” work (by the way that is still ongoing, there’s a draft manuscript now and I’m working on the figures) and Julius was also down. Both of us attended the fossil preparation symposium and this gave us some good opportunities to chat in the breaks and talk palaeoart. Two things that were covered in particular are areas I have an interest in: behaviour and aspect ratios. The other one might well sound a bit odd, but it’s actually linked to the point of some things being overly familiar. Both digital art and physical art often produce works that are pretty close to A4 in proportions, and while there’s nothing wrong with that per se, personally I find things that are in odd ratios (either very long or very tall) draw the eye in a very different way and can make you see and appreciate things rather differently. Perhaps it’s just a question of personal taste, but I do really like them and think it’s worth exploring more. I’m not sure if Julius felt the same way already, or was convinced by my magnificent and elegant arguments, but he was looking for some ideas for the book and so we went through a few possibilities and that was the last I’d head of it. We did discuss the pterosaur and squid picture a fair bit shown above, which resulted from a Solnhofen specimen at the Tyrrell I’m working on (and while we’re at it, there is a wee error in the book on this, it’s not skimming, and nor is it supposed to be) and I was occasionally asked about details on various pterosaurs and dinosaurs. Then one day, my inbox unexpectedly contained the first version of the fisheye image with a note to say it was inspired by our conversations in Alberta. It was a most pleasant surprise and at this point I’ll hand over to Julius to explain how and why he went for this particular composition. JC: A couple of things came together to generate the unusual composition of this piece. Ultimately, I’d have to blame Dave Hone for it. When I approached him about what he’d like to see in new paleoart, since I was working on a series of new pieces for the book at the time, we had a lively discussion about both dinosaur behaviour and artistic technique. It undoubtedly helped to be surrounded by dozens of archosaur skeletons in the Royal Tyrrell Museum’s Dinosaur Hall as we did so; it makes it that much easier to imagine a heavily gesticulated reenactment of dinosaur behaviour when the bones of the subjects are staring you down from ten or twenty feet above eye level. Dave voiced some great ideas about species interactions that had been relatively less explored by paleoartists in the past, including hypothetical tree-tippling feeding strategies of giant sauropods such as Apatosaurus. 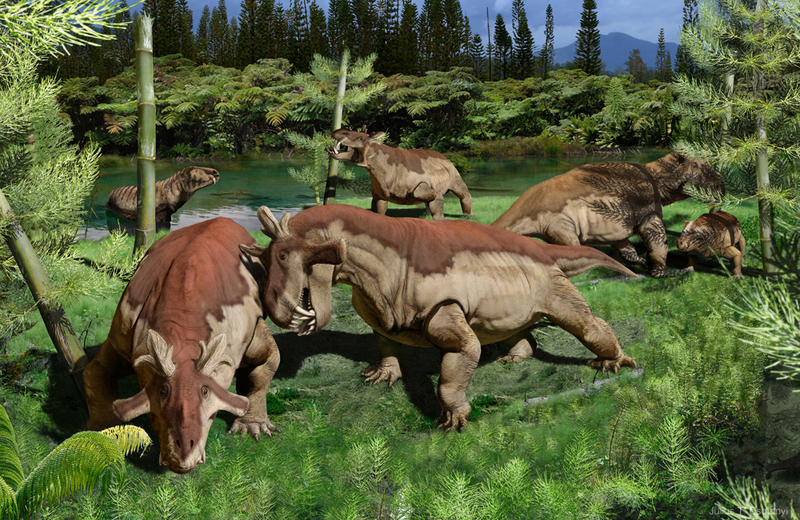 I have only seen a few reconstructions of this sort of behaviour, including an especially impactful one by paleoartist John Sibbick. However, in addition to biological subjects, Dave and I also discussed in a general context the appeal of applying unusual aspect ratios for artwork. Most of my collaboration with paleontologists involves an exchange of paleontological knowledge. The choice of the most effective artistic composition is usually left to me, though it is typically constrained by the requirements of the medium in which a piece is to be published. For example, it’s useful to keep in mind the aspect ratio of journal covers to encourage selection of a figure as cover image. For the current paleoart book, however, there was some more room for flexibility, and I am happy to consider people’s creative ideas for composition, and Dave was eager to express his interest in a departure from the norm of presentation format. For example, we talked about some unusually long and narrow canvases as interesting ways of depicting some sweeping scenes. The intent was to convey the huge size of the tree-tipping sauropods, so a view from a low angle looking up at looming animals seemed like a logical move. Normally, sauropods are terribly suited to depiction on low-aspect-ratio media (such as the nearly square shape of the planned book’s pages), so two solutions presented themselves: (1) foreshortening from a frontal view and (2) distortion, as from a wide-angle lens. 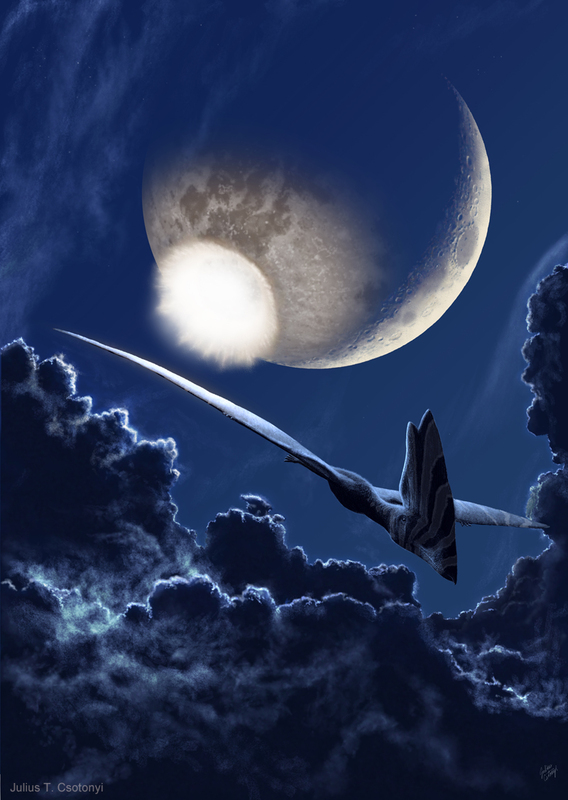 The second option better suited the goal of depicting things in an unusual way, so I flew with it. It then occurred to me that the most extreme wide-angle perspective distortion, showing all 360 degrees of the landscape arranged around the entire sky, would not only provide the best fit to a square page, but would also make for a very intriguing composition, with the long bodied sauropod wrapped around the image, following the curving horizon. Think of a reflective silver ball. If you were to set it down on the ground and stare into it from above, the reflection that you’d see on its surface represents the kind of image I’m describing. This was actually something that I had explored earlier in a 2005 pencil sketch of Seismosaurus (Diplodocus) and Allosaurus, and I’d been hoping to do something more substantial with it since. Well, here was the opportunity. I chose to place one of the feet of an Apatosaurus very near to the viewer in the image, because the resulting high degree of perspective would best convey the imposing size of the sauropod. This masochistic decision naturally required calculation of the greatest amount of perspective distortion of the animal’s body, and it took quite a few drafts to figure out how to properly wrap a receding sauropod around a circularized horizon. However, I found that an even greater challenge was the assignment of the angle of incident light on surfaces throughout a painting that is governed by Non-Euclidean geometry. The path of sunbeams on the Riemannian geometry of the surface of a sphere do not appear linear when mapped onto flat representations, but as curves whose degree of curvature depends on the distance that they approach zenith (the center of the image). I overlaid on the image a kind of field diagram of light rays from the sun to various target surfaces, which helped to render not only the correct phase of objects (analogous to the phases of the moon in various positions in its orbit) but also the shapes and directions of shadows cast by these objects onto the ground. Once the shape and lighting of the central sauropod was established, the rest of the scene was relatively easier to set up, because the remaining animals and plants were farther away, and therefore closer to the horizon, which in turn meant that they exhibited much less distortion and a narrower range of degree of light path curvature. Lacking an extensive academic artistic background, I’ve had to rely on principles of optics that I studied in physics courses during my undergraduate science program, and this project certainly required me to put some of this training to use. 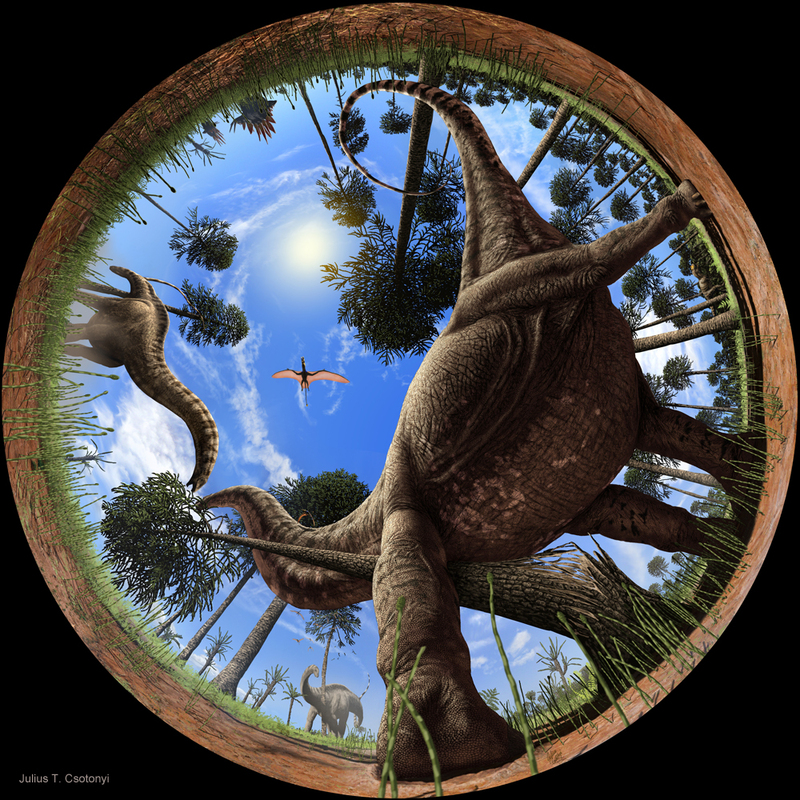 DH: Obviously the result here is stunning, I’m unaware of any other piece of palaeoart that uses a perspective like this and it does show off the sauropods from a most unusual angle as well as getting in some stunning detail and including a nice piece of possible behaviour. There are some details in there two, there’s a pair of stegosaurs, a Ceratosaurus skulking in the background, and a small pterosaur overhead with a some more escaping in the background. In the book, there’s also a companion piece to this in a much more orthodox view that shows an apatosaur group also mowing down a few trees, as well as a longer and more detailed description of all the work in perspective, lighting, and techniques that have gone into this piece. Importantly though, I think it brings something new to the table. We can grow goatees and put on berets and stroke our chins to debate the meaning of ‘art’ almost indefinitely, but this is something that goes beyond what we would normally consider palaeoart. Jon Conway has advocated the term ‘palaeontography’ for much of what we would currently term ‘palaeoart’, suggesting that (if I understand him correctly) that most works are often illustrative rather than artistic to draw a nice comparison, as with say wildlife illustration) . That’s not to criticise or dismiss any other form of palaeoart in any way, (if so, I’d be throwing out most of the Julius’s book, and the vast majority of what I’ve covered here on the Musings before) – I value the work, the skill and the aesthetics of much palaeoart (it hangs on my wall because I like looking at it), and the importance of these things for science communication or generally interesting people in the subject. Nor do I think we should stop producing mainstream works and move into things like this as a primary output. 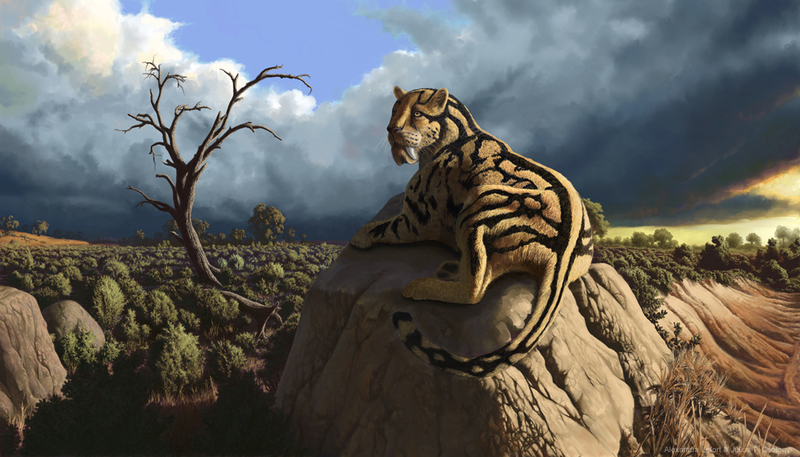 However, there are those who I think would dismiss palaeoart as ‘merely’ illustration (I’ve seen wildlife compositions and landscapes similarly dismissed), and this piece I think provides a resounding answer to that accusation. Yes there is talent, skill and artistic merit to huge amounts of palaeoart, but if works like this can help bridge that gap and help more people take this field more seriously, well that I think is most welcome for everyone involved in palaeontology. This piece is good because the image is well composed, has a fundamental aesthetic to it, the anatomy and scientific details are accurate, and there’s a clear skill in the technique and execution to it, but it is undoubtedly also highly creative and original and worthy of some extra note. Fans of palaeoart will have kept up with the various interviews I have done over the years with a wide variety of artists who favour the realm of long-dead organisms. 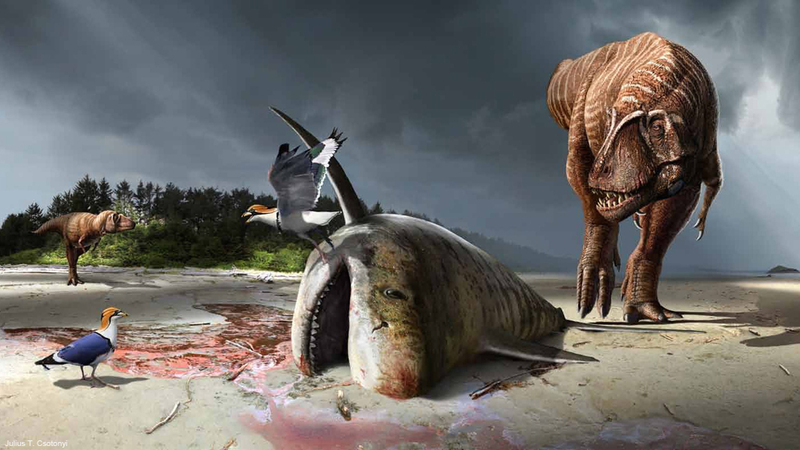 Today, however this is more directed to the specifics of the big new book in this field: The Paleoart of Julius Csotonyi. This obviously follows on from the popular ‘Dinosaur Art‘ of 2012, and like that, this is published by Titan and is edited by Steve White. Since I have written a few lines for the book and some of the work is based on things Julius and I have collaborated on, it seemed inappropriate to write a review (though it is great, honest), but being no strangers to answering my questions, Julius and Steve were kind enough to give me some of their time to be interviewed, and of course this is beset with images from the new book, and my thanks to them both for providing the words and images. (As ever, everything is copyright to Julius, so no taking it now). So, what is in the book? JC: Some words and lots of pictures (snicker, snicker). Lots of new stuff, actually. I created some of the artwork (nearly two dozen paintings) specifically for the book, and these have not previously been published in museum exhibits or books. 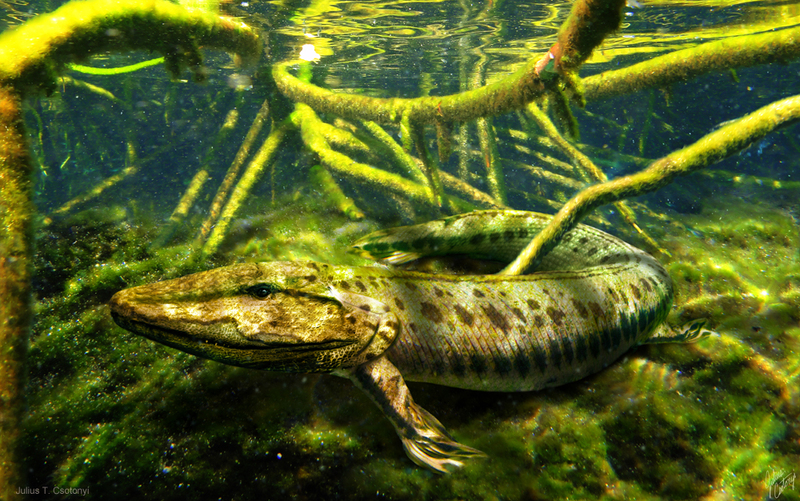 There’s also a large complement of images that were commissioned by researchers for press releases on newly described taxa or novel research within the past couple of years. Many of these have only sparsely been seen before. What I’m really happy about, and which differs completely from Dinosaur Art (2012) is the enormous number of pieces that have only appeared in museum exhibits around the world, making it highly unlikely for the average person to have seen them all. These include the life-sized murals for the Royal Ontario Museum (the “Ultimate Dinosaurs” exhibit, 2012) and the Natural History Museum of Los Angeles County (Dinosaur Hall, 2011), a wide array of traditional and digital drawings for several different exhibits at the Royal Tyrrell Museum (2007-2012), the unusual Permian landscapes for Gondwana Studios in Australia (2013) and the broad interval of time (Devonian to Pleistocene) covered by murals for the Hall of Paleontology at the Houston Museum of Natural Science (2012). Close to three quarters of the pieces have been published since 2012. I’ve also updated several older pieces to agree better with available information. SW: Without wanting to sound crass, pretty much what it says on the cover. It’s a career-spanning retrospective of Julius’ paleoart career; again, we’ve tried to include a certain amount of factual material, focusing, as with did with DA, on perhaps the lesser known or more unusual creatures that might not be too familiar to the casual enthusiast. Steve, how is this different to Dinosaur Art, either conceptually or overall, aside from featuring just one artist? SW: Well, the very obvious difference is the myopic focus on the actual work of a single artist this volume afforded us. DA was a little more generic in feel; in this one, Julius was able to go into considerable depth on his style and methodology. The previous volume didn’t really give us room for that. To Steve, with the contributors to DA, what led to focusing on Julius first in terms of the next run in this series? And Julius, did you approach this differently to DA with more scope? Was there anything you wanted to show? Julius also had the advantage of a backlog of work capable of filling a volume of the size we anticipated! JC: Compared to Dinosaur Art, I had a chance to create a considerable amount of new work. Unlike for commissions, I had more freedom to decide on the subject matter and to experiment with artistic style and format of presentation. There were a few different kinds of scenes that I wanted to explore, unusual kinds of interactions between species – more of them hypothetical, if plausible, than would generally be the case with commissions – and to play around with portraying scenes from unusual angles. Many of these new experimental pieces were inspired by conversations with paleontologists such as yourself. 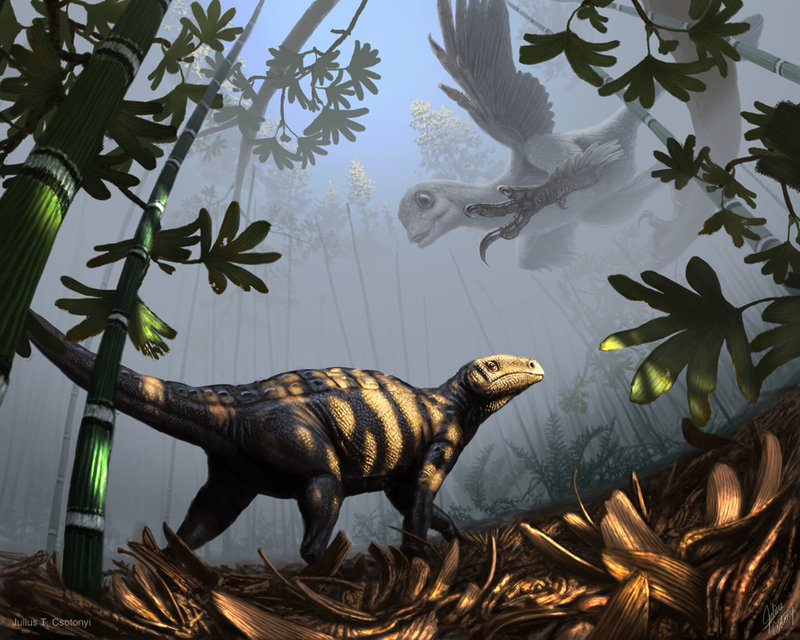 The encounter scene between Sinornithosaurus and Liaoningosaurus (below) stands out as a good example, as does the Apatosaurus tree-tipping scene [Ed: this last one will be getting its own post shortly]. Is there some kind of theme to the book? JC: The book is separated into four sections: a Q&A section followed by the artwork, which falls into three broad temporal intervals: Palaeozoic, Mesozoic and Cenozoic eras. This allows there to be a way of organizing the work that is familiar to many paleontology enthusiasts while keeping the media and styles of the artwork sufficiently shuffled to maintain an ever-changing presentation. SW: We did want to do a sort of temporal/geological approach so that casual readers could immerse themselves in a visual representation of the evolution of life on Earth. This was largely because Julius had done enough art from throughout Time and it was this that very much drove the layout and look of the book. Julius, how have you developed since DA came out, either in style, technique or interest? JC: When DA came out, I was in the height of applying the technique of photographic compositing. Since then, I’ve felt an increasing interest to move back toward manual painting (at least digitally, but also some more traditional non-digital artwork). I still do a lot of photographic compositing, and a lot of new material appears in the book, but I’ve also taken the opportunity offered by the book project of creating noncommissioned work to flex my traditional painting muscles some more, and a lot of the newest material in the book is digitally painted. I’ve received some favourable responses to this kind of artwork, but traditional painting has also always given me more of a thrill to do than does building up a scene photographically. 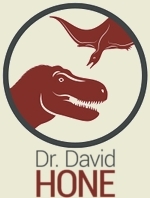 In terms of interest, I think that my interests have broadened since the publication of DA, and I am currently involved in producing more pre-Mesozoic work than I did before. It’s a time interval that I’ve neglected earlier, and I’m eager to explore some of the earlier, weirder points in earth’s history. What is your favourite part of / picture in the book? JC: Like any artist, I look at older pieces and I find myself frowning at things I would now do differently as my knowledge changes and new information is published, However, from an artistic standpoint, there are quite a few new pieces that have given me a lot of enjoyment to produce. There’s a Sinornithosaurus piece that was absolutely fun to create because of the freer, more expressive style of paining that I used in it than I’m used to. Certainly one of my favourite new pieces to create was a painting of a group of Apatosaurus feeding on trees that they have toppled using their bulk. This one was fun from its inception – it was generated from a lively discussion that you and I had in Dinosaur Hall at the Royal Tyrrell Museum last year – through to its design and completion. 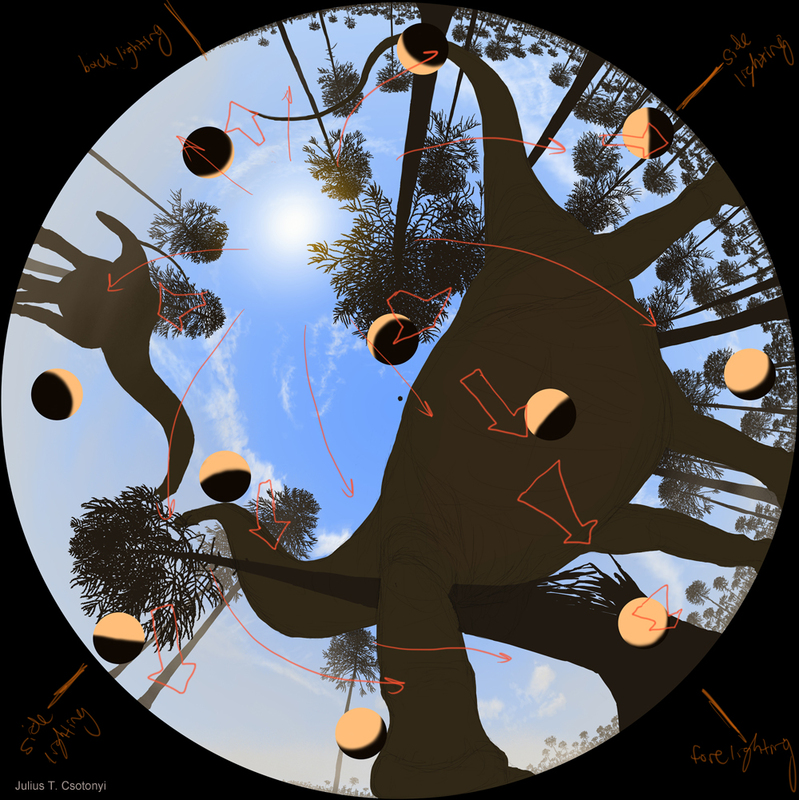 It features a very unusual perspective, demonstrating what we would see from ground level through a bug’s eyes, showing the full 360 degrees of rotation and the entire range of sky to horizon. It was a challenge to generate the appropriate amount of distortion in the trees and dinosaurs, but I’m reasonably happy with the final result, both in the composition and the amount of detail that it contains. SW: I have to say, my fave images are the very newest. I think those are the ones where you really see everything that he has learnt as an artist really come together. I am thinking particularly of the Acheroraptor piece, which I really loved, and the Sinornthiosaur one as well. What is next for each of you? SW: I’m actually just wrapping up my third artbook as editor, although this one is somewhat different, thematically, as it focuses on aviation art. This isn’t a multi-artist volume though, but the work of Adam Tooby, who’s very much on the cutting age of this particular discipline, using digital art in an otherwise very traditional medium. 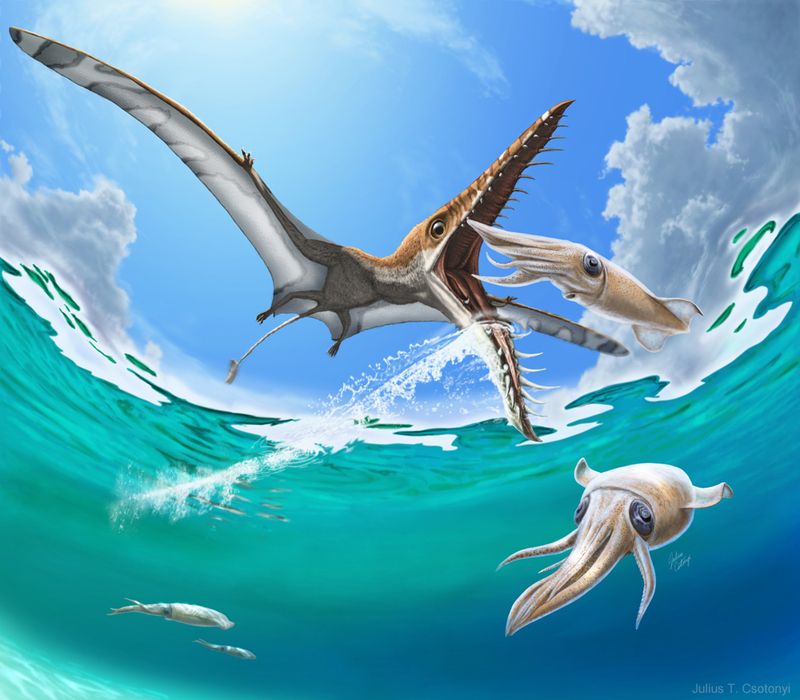 I guess in some ways there is a slight crossover with paleoart in that they are both very much at the edge of Fine Art (in my opinion anyway); but they both produce artwork of incredible quality but largely overlooked. I am very happy with this one and looking forward to seeing the final result. In the meantime, my comics day job keeps me pretty busy, but I am wondering about future artbooks. They are a lot of work for me on top of my full-time editor job and I couldn’t do them without my line editor in Titan Books, Jo Boylett, who’s the real power behind the throne. But we have discussed future titles. DA has done so very well for us so another multi-title volume could be a possibility; I even have a theme for it, but we’ll see. And, as I mentioned, if Julius’ book does as well as we expect, it could hopefully allow me to do another single artist book. JC: At the moment, I am working on a number of museum exhibits, book contributions and research press release images. I think that even aside from the book, 2014 will probably be a pretty productive year for new artwork. Some of this will come from collaborative work between myself and my wife, Alexandra Lefort, who is not only an accomplished planetary scientist, but also a talented artist herself, focusing mainly on wildlife (hence the opportunity for collaboration) [see the above picture]. A major overhaul/update of my art website is also in the works (also largely due to Alexandra’s skills and efforts), and I will be making a lot of my pieces available as prints on my growing print website. As time permits (sigh…), I also want to post new entries to my science blog, Evolutionary Routes. In terms of the direction of my artwork, I mentioned an increasing interest in painting (both traditional and digital) over photographic compositing, and I think that quite a few of my upcoming pieces will reflect this attraction to a somewhat more painterly style. I’ve also become increasingly interested in using my artwork to promote biological conservation efforts. One of the ways in which I wish to apply traditional painting techniques is to generate original artwork to help raise funds to protect vulnerable to endangered organisms such as sharks, or fragile ecosystems. There are many possible avenues to explore in this arena. And as time permits, I’d really like to get out on some paleontological digs and get dirty.